If you're a fan of comfort dressing when it comes to fashion, you'll love this totally chic pairing of a grey crew-neck sweater and a RED Valentino red studded shoulder bag. Rocking a pair of black studded suede ankle boots is an easy way to add extra flair to your look. 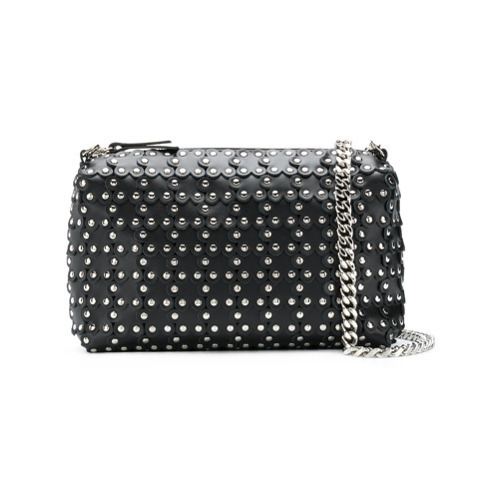 Dress in a grey vest and a RED Valentino red studded shoulder bag from farfetch.com if you're in search of an outfit idea for when you want to look casually cool. Got bored with this look? Enter black suede heeled sandals to change things up a bit. If you're a fan of practicality dressing when it comes to fashion, you'll love this stylish pairing of a pink fur jacket and a black studded leather crossbody bag. Look at how well this look pairs with black leather lace-up flat boots. If you're all about functionality dressing when it comes to your personal style, you'll love this adorable pairing of a green blazer and a RED Valentino red studded shoulder bag from farfetch.com. Black leather lace-up flat boots look amazing here. Team a white and black leopard crew-neck sweater with a RED Valentino red studded shoulder bag if you're searching for an outfit idea for when you want to look casually cool. Make black leather over the knee boots your footwear choice to va-va-voom your outfit. If you're all about comfort dressing when it comes to your personal style, you'll love this chic pairing of a navy coat and a black studded leather crossbody bag. For something more on the daring side to complete this outfit, choose a pair of green rain boots. If you're all about relaxed dressing when it comes to your personal style, you'll love this extra adorable combo of a red cardigan and a black studded leather crossbody bag. Add a glam twist to your ensemble with black chunky leather lace-up ankle boots. If you're obsessed with relaxed dressing when it comes to your personal style, you'll love this totally stylish pairing of a black coat and a RED Valentino red studded shoulder bag. Consider black embellished low top sneakers as the glue that will bring your look together. If you're all about practicality dressing when it comes to your personal style, you'll love this chic combination of a black quilted leather biker jacket and a RED Valentino red studded shoulder bag. Wearing a pair of black leather pumps is a simple way to add some flair to your getup.